In one of the first numbers in Violet, a young woman boards a bus carrying a battered old suitcase. “I’m on my way…” she sings. Fewer than a dozen chairs onstage and the audience’s imagination transport us onto the Greyhound bus that takes Violet (Christie Jackson) from her home in Spruce Pine, North Carolina, through Nashville, Memphis, and finally to Tulsa. Imagination also is how the audience sees the deep scar that disfigures Violet’s face, the result of an accident with a flying ax blade when she was thirteen. Violet, now in her twenties, is heading to see a televangelist she believes can heal her scar and make her motion-picture beautiful. But it is, of course, the journey that changes her profoundly. Rich Mason’s marvelous set serves as bus station, bus, diner, hotel, church, and other locales. Musical director Kim Fox assembled a tight five-piece band that backs up a stellar group of actor-singers. Director Chase Kniffen once again assembled a talented cast and let them shine. Jackson appears both wholesome and tormented, and possesses a voice that ranges from tender to powerful. The scar we can’t see becomes real in the reactions of the bus driver and those she encounters, who recoil in shock. Jackson’s emotional intensity glows as she experiences shame, self-loathing, and fear that her deformity might subject her to a life alone – while hoping that a miracle will allow her to lead the life she dreams of. Violet’s trip to Tulsa is often interrupted by painful childhood memories, which blend in with the present-day action. Sophia Bunnell, who plays Young Violet, is outstanding, with a beautiful voice and commanding stage presence. Much of Violet’s story unfolds as seen through the eyes of the teenager coming to grips with her mangled appearance. Joe Pabst plays her father, trying to protect and empower his daughter while dealing with his own guilt and her anger. 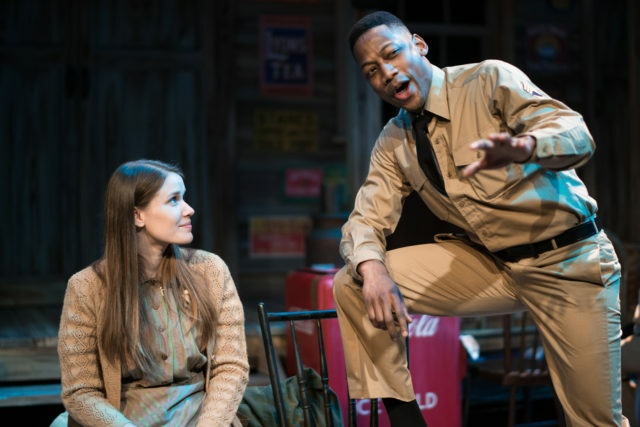 The show’s core, though, is Violet’s time on the bus and on the road, where she meets two young soldiers, the handsome charmer Monty (Matt Polson) and his easygoing African American friend Flick (Josh Marin). Integration is still a new concept in 1964, especially in the South, and Flick, like Violet, is used to being seen as an outsider, a bond he shares with her. Both Monty and Flick are drawn to her, and she to them for different reasons. Violet has many musical highlights, including the peppy “On My Way” to start the trip and the haunting “Lay Down Your Head” after a bittersweet night in Memphis. A real showstopper is the joyous “Raise Me Up,” featuring the powerhouse vocals of Karla Brown, which heralds Violet’s arrival in Tulsa and attempt to meet the televangelist (Eric Williams). In a cozy theater like Virginia Repertory Center’s Theatre Gym, this taletned cast probably didn’t need to be mic’d. Again, Cadence Theatre Company proves that it’s doing some of Richmond’s best theater work. Violet is definitely worth a look for teens and their parents. Parenting note: some of the show’s themes, language and actions are best suited for age thirteen and up. Violet runs through March 11 at the Theatre Gym at the Virginia Repertory Center. Visit Virginia Rep for showtimes and tickets.